Due to high prices, a number of students don’t take the Advanced Placement (AP) exams every May; this year, however, things have completely changed. The College Board — the non-profit organization that oversees AP, SATs and PSATs — has arranged to make AP tests free this year in the Sacramento City Unified School District (SCUSD). For decades, the College Board AP program has encouraged students to take AP classes to challenge themselves and glimpse what college courses are like. Scoring well on the AP tests benefits students who are interested in college admission, but it was an expensive proposition, averaging $90 per-test. Until this year. 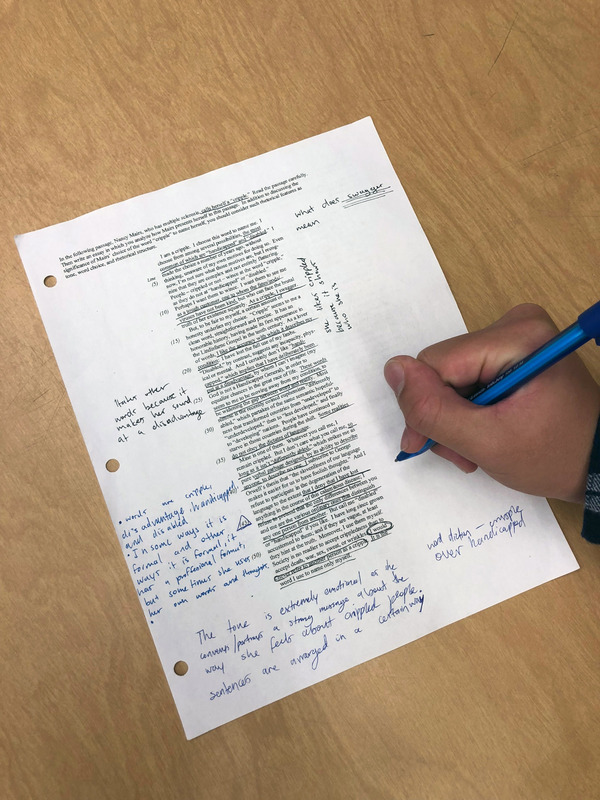 An AP English student annotates one of several Free-Response Questions (FRQs) used by the class to prepare for the AP Exam in May 2019. Clarion staff photo. Where is the money coming from to buy these exams? The tests are free this year because SCUSD is using funds from the College Readiness Block Grant, meaning that free tests are going to be temporary. Christine Espinosa, Director of Guidance and Counseling for SCUSD, states that students “will register to take AP exams for the AP classes in which they are enrolled. Students may work with their school to register for additional AP exams if desired. Once a student is registered for the exam, they have made a full commitment to take the exam.” Overall, free AP tests are only guaranteed for the 2018-2019 school year, making this year a unique advantage for students. Free or not, what can students do to prepare for AP exams? There are numerous ways to prepare for the exam and tons of resources. The College Board website is a great place to start the AP journey because of its course overviews, practice test problems, and lots of information on scoring rubrics. The best part of having access to these resources is that they’re all free, and can be used at any time to help better understand the concepts of the AP course. Although it is free, students may want to deepen their AP knowledge, which is where AP prep books can be helpful. Though AP prep test books cost money, they are helpful in teaching the key ideas of the exam and are constantly updated to the new AP tests, which is another bonus. However, these resources can only be used if the students have the will to study and prepare effectively, ultimately determining how well they score on the AP test.